For some time, my daughter and I had been butting heads over algebra. While I could solve the problems myself (err, most of them anyway), I wasn’t able to explain the mathematical reasoning behind my strategy. It wasn’t long before I began considering the possibility of a dual enrollment course. In the United States, dual enrollment programs allow students to be enrolled in two separate, academically related institutions. Generally, it refers to high school students taking college or university courses. In the fall of 2016, my daughter enrolled in her first course at the community college, Algebra I. The instructor informed the class on the first day that if they worked hard and completed the coursework early, they could subsequently enroll in Algebra II that same term; receiving credit for both while paying for only one. This was a great transition to college for her. She succeeded and thereafter enrolled in the subsequent course and added composition winter term. By spring, she was taking three courses, each of which were applicable to an associates degree while simultaneously satisfying high school graduation requirements. Dual Credit or Dual Enrollment is a partnership between the high school and a local college. While an AP course prepares students to pass an exam to prove their mastery of college-level curriculum, dual credit in effect enrolls students in college courses while they are still in high school, allowing them to earn credit for both. Courses are taught, usually in the high school, by teachers deemed qualified by the partner college. In our case, my daughter is taking the courses directly at the local community college alongside admitted college students (most have been taught on campus but a couple of been delivered online). Initially, I awarded her high school credit on her homeschool transcript. We have since opted to partner with a local umbrella school – I elaborate on that decision here, The Perks of an Umbrella School vs. Remaining Independent – and she will thereby receive a high school diploma from an accredited school. Dual enrollment courses are real college courses for real college credit; the final grades she receives will go on her permanent record and are reflected in her college GPA. As such, it is important to make sure your student is ready for the demanding work a college class will require. Is She Eligible for Scholarships? This is invariably the most common question I hear when talking about dual enrollment. 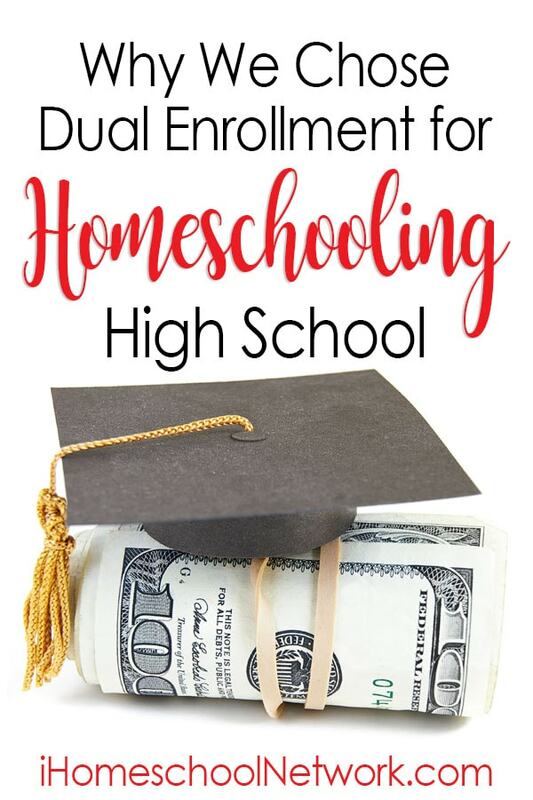 In fact, there has been a lot of discussion recently on homeschool forums regarding dual enrollment and a student’s eligibility for scholarships. I have seen essentially two disparate answers and I suspect the correct answer for you will depend on the college your child hopes to attend. I would highly recommend that you sit down, live and in person, with an academic advisor from the potential university and ask them. In our experience, the advisors at the community college were not well versed on the admission requirements of all four-year institutions and even less so about scholarship options. How can they be? In Oregon alone there are 7 public universities, 17 community colleges, and 67 private colleges and universities, each offering a diverse range of academic opportunities and degree programs. After we had spoken with three community college advisors and all were unable to answer my questions for our state public universities, I knew I had to reach out to the school specifically. We have since sat down with two different advisors – an assistant dean of academic programs from the college of engineering and another from the specific pro-school in which she hopes to enroll. Conferring with the university is critical – some professional schools do not accept college credits taken while in high school. Some require specific grades and will not accept AP credits. Always seek advise specific to your goals and areas of interest. While she may not be eligible for scholarships earmarked for freshman, she will be eligible for scholarships for transfer students. The school she desires to attend awards approximately $70,000 in scholarships each year to students in each of three categories: incoming freshmen from high school, transfer, and continuing students. At the time she transfers, her first two years of college will be complete and paid for – with only two (maybe three) years remaining along with the money we continue to set aside in her 529, the savings we see now far offset a potential scholarship (receiving one is not a guarantee, after all). While many worry about the atmosphere young students will be exposed to on a college campus, my daughter’s experience at the community college has been wonderful. She takes a full course load each term and has excelled in her studies. She has always been intrinsically motivated and is now surrounded with like-minded students. Her first year on campus was a stepping stone, gradually adding courses each term and getting accustomed to college life. This year, she has really blossomed and come into her own. She has connected with fellow students with similar interests – she even joined the creative writing club and debate team. Her peers and math professor have encouraged her to apply for a position in the tutoring lab and an adult student (who has children on our club swim team) has hired her to teach art to her girls. Her goal is to graduate high school while simultaneously completing her associates degree. In essence, she will have over 95 college credits – or two years of college level course work – completed by the time she graduates high school. Upon transferring to the university, she will enter as a junior and have only a few courses remaining prior to beginning pro-school. I do not worry about pushing her too hard as this is a goal she set for herself. In fact, while meeting with the dean she remarked, “I want to do pro-school now! I wish I could just jump past high school.” I am now her cheer leader, informal advisor, and occasional proof reader. While dual enrollment may not be the answer for all students, it is certainly an option worth your time to research.